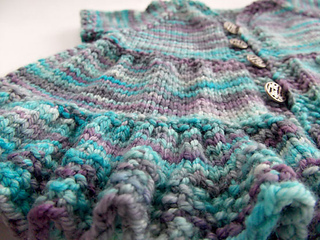 Knit top down with raglan sleeves, this is a cute but easy short spring dress knits up quickly in both solid and multi color yarns. Seed stitch details add a delicate touch to the pretty ruffle trim and hems. Sizes 3 to 24 months. Perfect for spring and summer, or pair with leggings and a long sleeve shirt in the winter. Available in print through Magcloud: Ruffle Dress Print. See wholesale page for wholesale info for print patterns. 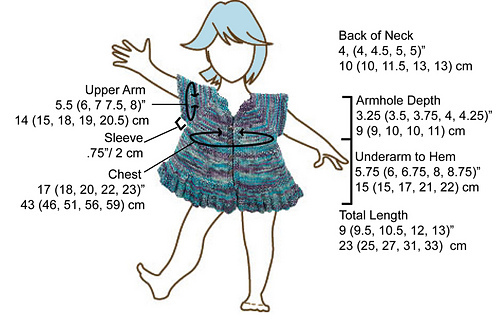 See schematic for more sizing info. Shown in 3 month size. 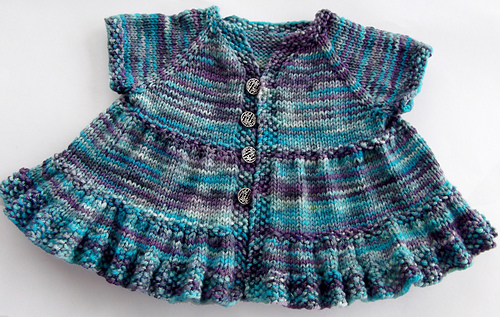 Dress is knit back and forth from the top down with raglan style increasing for the sleeves. 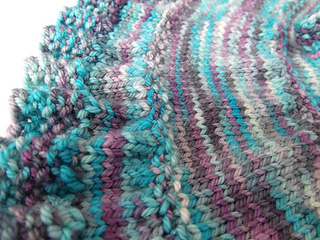 Sleeves are worked in the round on double pointed needles. 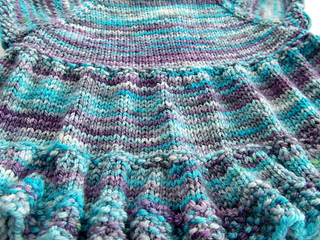 Work the first and last 4 stitches of every row in Seed Stitch unless otherwise noted. If not noted, move stitch markers as you come to them. 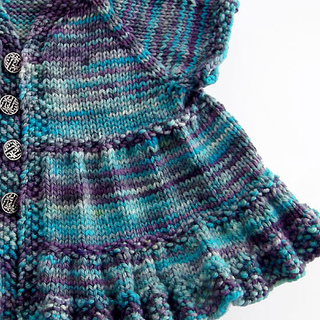 Buttons: If you are worried about buttons as a choking hazard you may wish to substitute a zipper, hook and eye closures, or simply seam up the front. You may also wish to add additional buttons to the bottom of the dress if the dress will be worn on its own so it will stay shut.